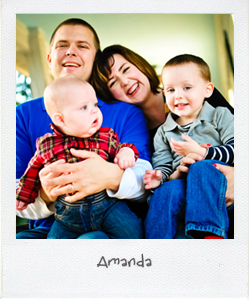 Amanda is a 30-something who lives in Texas and has her whole life. She used to work for a software company doing QA but is now a full-time SAHM. She is married to Jesse, a fantasy football loving, all around super smart techie guy and together they have a three-year old wild man, Jack, who is the spittin’ image of his daddy but has his mama’s sense of humor and a 7month old chunk of a baby, Hank, who is even more the spittin’ image of his daddy than wild man. Amanda loves all things Mexican including but not limited to home decor, the cuisine and the margaritas. She is also a huge fan of the monthly girl’s dinners with her friends, any and all turquoise jewelry, Crystal Light lemonade, and Dolce Vita sandals.